Welcome to the Holiday Inn Express & Suites Near Universal Orlando� hotel As an official Universal Orlando� Hotel Partner, we offer an unbeatable stay for your next Orlando vacation! Walking distance from Universal Studios� Florida, Universals Islands of Adventure� and Universal CityWalk�, with a free hot breakfast buffet daily and free Wi-Fi, our hotel combines a dependable Holiday Inn Express stay with the jaw dropping excitement of Orlando. Choose from a spacious suite, a king or a double room while enjoying proximity to other popular Orlando attractions like The Holy Land Experience, Walt Disney World� Resort, SeaWorld� Orlando and Aquatica. Just a few minutes off International Drive, explore the best shopping, restaurants and entertainment in Orlando. Orlando Premium Outlets, Festival Bay, and Mall at Millenia are all five minutes away and our 100% smoke free hotel is only 15 minutes from downtown Orlando. 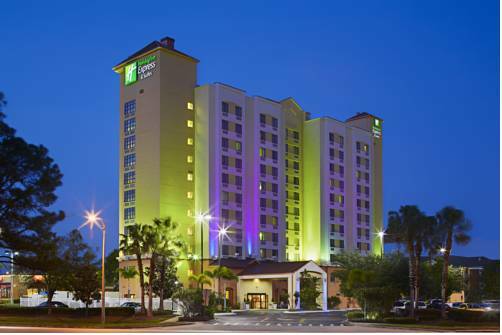 Business travelers will also appreciate the location of our hotel just 10 minutes from Orlando Convention Center. Spacious work desks in every room, a business center, fitness center, and outdoor pool will make sure your work and health dont skip a beat. Book a reservation today and enjoy great Universal Orlando hotel deals and rates at our Holiday Inn Express & Suites hotel near Universal Orlando. Must be 21 years of age with valid credit card at check-in. �Feel the ElectriCITY� as you enjoy the best in live music, casual and fine dining, dancing, shopping, movies and more at Orlando�s hottest spot for entertainment. Upscale indoor shopping mall. Located just 5 minutes from the hotel. Sea World immerses guests in the mysteries of the sea through upclose animal discoveries, amazing attractions and rides, and unforgettable performances. Drive time from the hotel is just 15 minutes. Set sail on the high seas as your adventure includes the perfect blend of comedy, romance, swashbuckling swordplay, high energy escapades and dinner! A research laboratory turned upside down by a science experiment gone awry. Explore the more than 100 interactive exhibits and experiments inside which still remain intact. This amusement park for the mind is fun for all ages.